It has already approached a number of agencies about the process, but meetings have yet to take place. The company is looking to ramp up its marketing activity and improve awareness and public perception of the brand. It is thought that Seatwave is keen to increase the public's recognition of its varied offering, as well as reassure consumers that it provides a safe service. 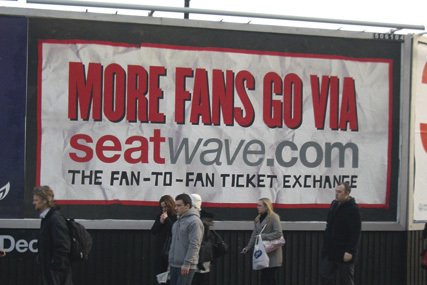 With a range of new online ticketing services emerging, many of which are garnering bad press with reports of poor customer service and fraudulent tickets, Seatwave is keen to show that its offering can be relied upon. A number of Seatwave's closest rivals have similarly looked to appoint major agencies in recent years in a bid to set themselves apart from the increasingly intense competition. Last year, Viagogo appointed DLKW Lowe to handle its ad account. Until now, Seatwave has used agencies to create advertising campaigns on a project basis. In March last year, it worked with Space City Productions to launch its first TV ad, which focused on three music, sport and theatre fans who used the site to secure tickets they wouldn't have been able to get elsewhere. Before that, the brand worked with M&C Saatchi on a poster campaign.